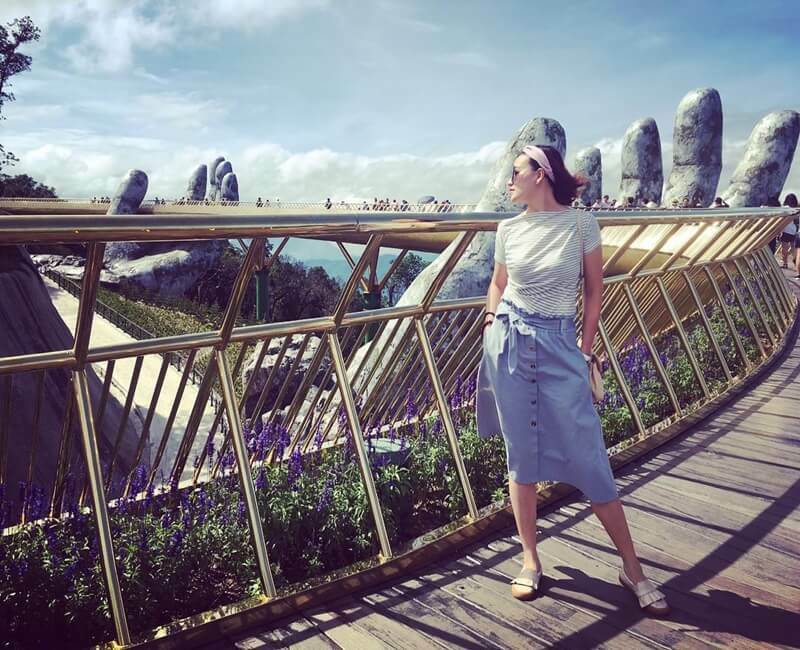 Golden Bridge in Danang is located in Ba Na Hill with 1,414m height above sea level. 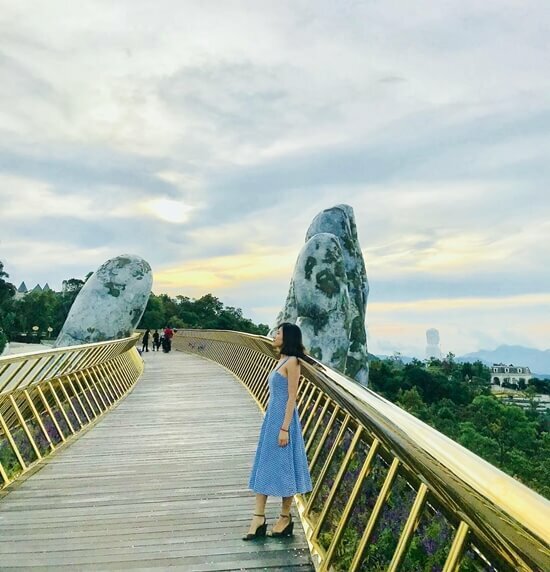 In the top of the hill, the bridge is brilliant like a “silk ribbon” in the air. The bridge has 8 spans and 150 meters long. Its impressive architecture combining with the large space and the clear blue sky creates incredible views. You will love it. 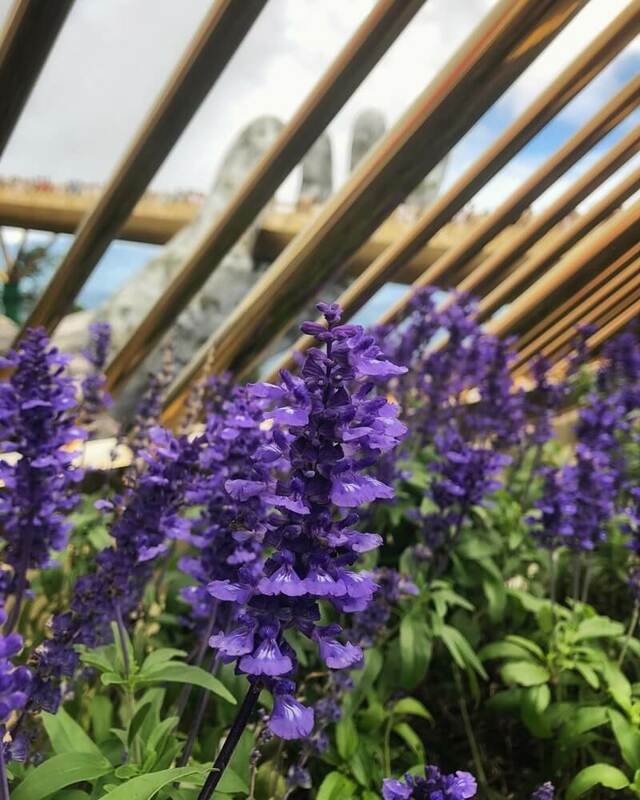 The best time to visit Ba Na Hills is from April to September. This duration is the dry season in Da Nang City. 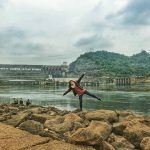 Although it is good to visit Ba Na because of no rains, and clear cool weather on the top of the hills, it is really hot in the plain of Da Nang City. Sometimes, it can get up to 39 degrees Celcius. Thus, you should notice this detail to plan your itinerary when coming to the beautiful city. Two huge hands support the bridge with a diameter of about 2m of the fingers. Contrary to the elegance of the bridge, the ancient style of hands creates the nostalgic atmosphere. According to the design company TA, the hands of the mountain god takes the “silk ribbon” from the rocky mountain to help the villagers to go up the heaven garden. In the Golden Bridge, the best way you have a flycam is to take pictures, you will consider here as the heaven. 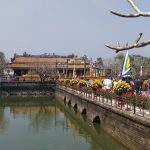 However, if you are amateur photographers, you can also get many amazing photos at different corners on the Golden Bridge. 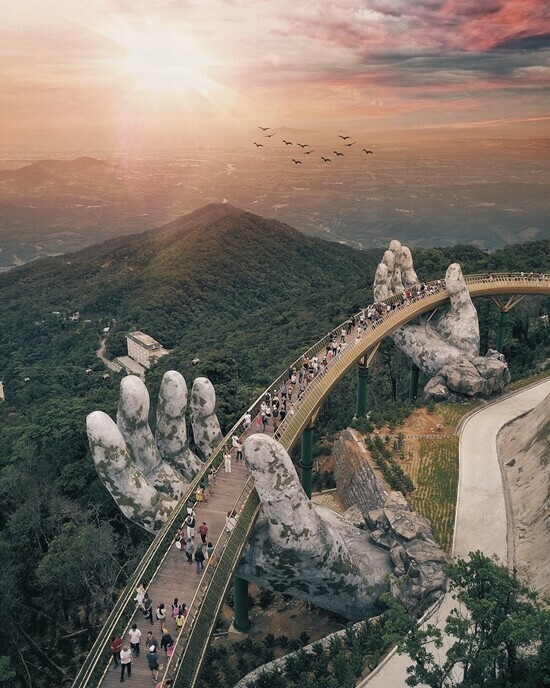 The Golden Bridge in Ba Na Hills (Danang) is stirring up the world community these days when it was crowded with celebrities including CNN, BBC, The New York Times, The Times, The Guardian, Bored Panda, National Geographic … Many famous travel loggers also show the attractive photos of this bridge. 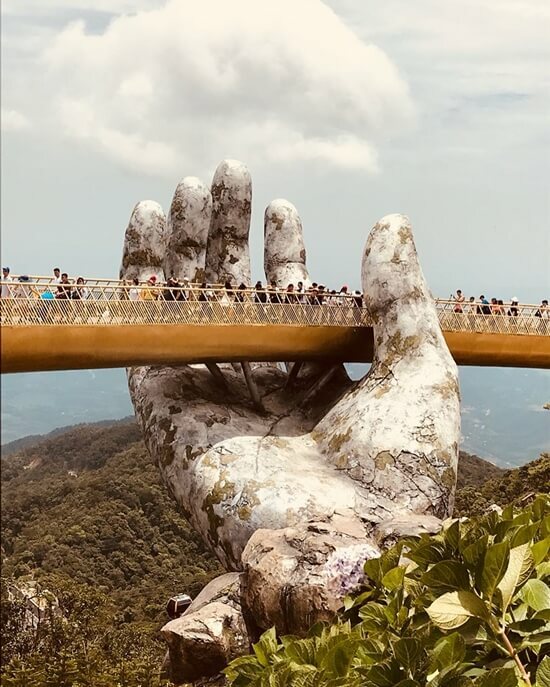 The owner of the smashpop account on Instagram – Jason Goh guy from Malaysia – received more than 33,000 likes for the photo of the Golden Bridge Danang taken with his flycam. Without flycam, you can take nice pictures like @us.on.earth when you stay on the right the middle on the bridge. However, you need to wait for a long time to get wonderful photos, because many tourists walk up and down every day. A photo with the flower corridor of the bridge also creates an amazing look. The romantic place will appear in your photos. Now take a look these photos. Another corner will get beautiful photos as well. You stand out of the bridge, and take pictures of the old strong hands like @josmika. Now, it’s your turn. 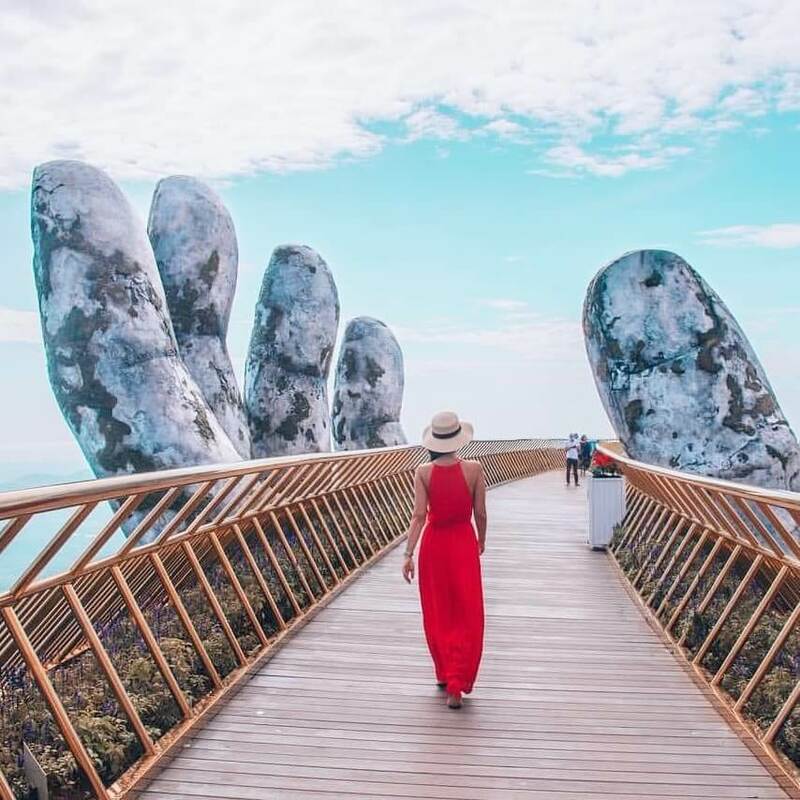 Will you come, take beautiful pictures, and enjoy the great views from the Golden Bridge in the Bana Hills, Danang City, Vietnam?